7 in. x 20 in. 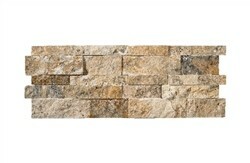 3D Stack Spli..
Scabos Travertine is a variety of travertine which has it’s origin in Turkey. It’s color varies from medium grey to dark. It’s a marvelous tile to surround your home with- especially if you are redesigning your kitchen, it is a great tile to watch out for. Great kitchens are adorned with the use of scabos tile. 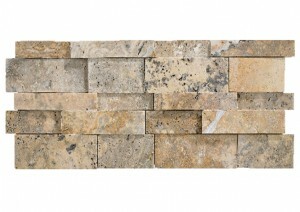 The rustic mold of the scabos tile is very attractive. It creates a classic ambience in your home. The tiles is not only filled with classic look but it also has a modern touch. Here at marblenthings we have both honed and split face finish. The colors that are available now are multicolor and brown. The pattern that we have now is brick pattern. The shade varies high. The scabos travertine adds luxury to your ledger panel. Very few tiles are as exciting in look and feel as scabos tiles. When you have visitors to come to your home and you have scabos tile installed you can be rest assured that the visitors are going to stand in awe of the great beauty that the tiles represents. Again it will make your kitchen more than just a place to process food. It will make it a place of your house that will stand out among everything else.